If you say "Jack in the Box" backwards, it sounds like "Sausage." Of all the easily targetable "penises" in this logo, I'm glad to finally see a different joke. The Tim Tebow of Fast Food Restaurants. the loaves and fishes miracle continues! OH MY GOSH!!! IT REFERENCED CHRISTIANS!! therefore it must be bad! Chick Fil A is gonna be pissed they didn't think of that. No no no! It's spelled Jeebus. It actually looks a lot more like a cataquack from Mario Sunshine. 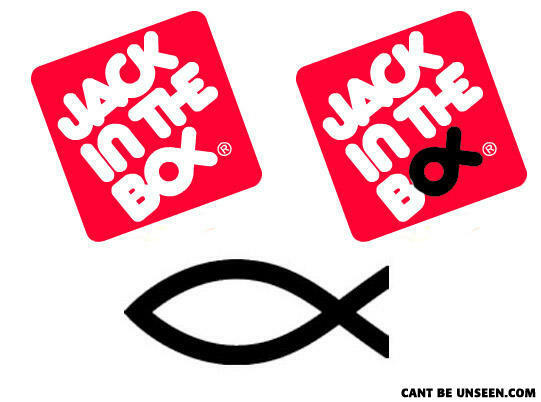 Jack in the B-Jeezus Fish!! Now we know jack in the box!